The Mets will play their first postseason game since 2006 on Friday night in Los Angeles. It is hard to believe that it has been nine years. It doesn’t feel that long because all of the disappointing seasons since 2008 blend together in my mind, but when I think about where I am as a person compared to where I was then, I realize that a lot of time has passed. When the Mets lost the NLCS in 2006 I was in the first year of my Ph.D. program, I was still married, and I was living in Illinois. Now I have been out of school and Illinois for nearly four-and-a-half years, and my personal life is completely different. I think the reason it seems like fewer than nine years in baseball terms is that the pain of the 2006 loss and the 2007 and 2008 collapses still remains fresh in my mind. But this year’s Mets have a chance to heal those memories. Although they had only the fifth-best record in the National League, their excellent pitching and resurgent hitting makes them dangerous, and enough weird things happened to them during the regular season that they seem like a team of destiny. Relief Pitchers: Jeurys Familia, Tyler Clippard, Addison Reed, Jon Niese, Hansel Robles, Sean Gilmartin, Eric Goeddel, and either Bartolo Colon or Carlos Torres. Colon is a risk since he is not normally a reliever, but he’s been pitching better than Torres of late. If Uribe is healthy for the NLCS, I would go with 11 pitchers because only four starters are needed, and I would leave either Jon Niese or Bartolo Colon/Carlos Torres off of the roster, whoever performed less well in the NLDS out of the bullpen. But if the Mets insist on sticking with 12 pitchers, I would leave Cuddyer off of the NLCS roster unless he gets red-hot. 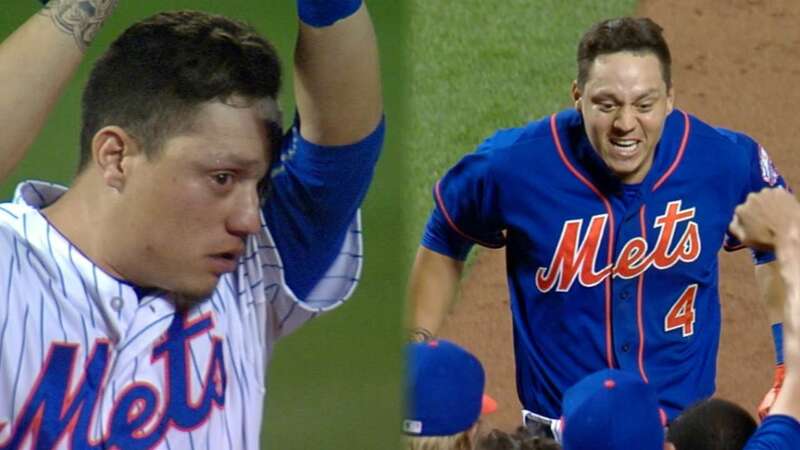 Wilmer Flores, Mets folk hero. It has been a weird, strange season for the Mets. They have had the highs of a franchise record-tying 11-game winning streak, several 7-game winning streaks, sweeping a season series against a National League team for the first time ever (they went 7-0 against Colorado), and historic (team-wise) home run production. They have had the lows of Zack Wheeler missing the season due to Tommy John surgery, of being no-hit, having long stretches when it was rare for them to score even three runs per game, and being swept by two other playoff contenders, the Pirates and the Cubs. They just won 20 games in August, their first 20-win month since 2000, the last time they made the World Series. They now have a Tug McGraw-esque folk hero in the nearly-traded Wilmer Flores. If they win the National League East (Old Man Voice: “Back in my day, they called it the National League Eastern Division”), Sandy Alderson has to be Executive of the Year for his shrewd trade deadline deals and timely call-up of Michael Conforto, and Terry Collins will be a strong candidate for Manager of the Year despite his consistent inability to properly manage the bullpen (including last night’s loss to the Phillies, when his decision to bring in Bobby Parnell to pitch the sixth inning was a blatantly obvious disaster waiting to happen that then promptly happened). Going into tonight’s game with the Phillies, the first place Mets have a 6.5 game lead over the Nationals with 30 games to play. The Nationals have a game in hand (their game tomorrow against Atlanta), and play the Mets six more times this year. Therefore, in a worst-case scenario where the Nationals win tomorrow and then sweep the remaining games with the Mets, the division title comes down to which team plays better over their 24 other games. The Mets have four games against the Reds and three against the Yankees, with the rest of their games being against the Marlins, Braves, and Phillies, while the Nationals have three games against the Orioles and a make-up game against the Reds, with the rest of their games being against the Marlins, Braves, and Phillies. So the Reds might play a bizarrely pivotal role in the race, but it is appropriate that for the most part the division title will be decided by which team does a better job of beating up on the rest of the division. I feel good about the Mets’ chances. Their recent bullpen additions should help shore up their recently shaky relief pitching (which still isn’t as shaky as the Nationals’, as the Washington ‘pen has blown late multi-run leads the past two nights), their starting rotation has been excellent and will be strengthened by Steven Matz’s return this weekend, and their offense is now respectable, and will get even more dangerous once Lucas Duda returns from the disabled list. The past month as the Mets have moved back into first place has been incredibly fun for me as a fan. It reminds me of the vibe from back in the mid-1980s as a kid when they were always in the hunt, and there was always that delicious pennant race excitement. It makes it hard to concentrate on anything else. Let’s Go, Mets!